Greetings from the Openness and Reproducibility in Science Workshop at the Australian National University in Canberra. Rosalind Attenborough (University of Edinburgh) talked on her PHD research on "Scientific openness: a new epistemic virtue?". The talk was a lot more accessible that the title of her research would indicate. She is interviewing researchers to get tier vies on what openness is, its perceived benefits and problems. Rosalind briefly mentioned open source software as a progenitor for open science. So I asked her why she did not look at the history of open source software. It seems to me that many of the issues with openness, particularly the reward structures for people working in it and resourced had already been solved by the software community. Open source software is now produced by everyone from individuals, to academics, government agencies, and multi-billion dollar corporations. We routinely teach computing students about the tools and techniques of open access, including how to make a career out of it. 13.30-13.50 Talk: "What's So Open About Plant Pathology?" The ACT Board of Senior Secondary Studies has released a suite of proposed Technologies courses for comment. These are designed to fit with the Australian Curriculum Information Communication Technology k-10. I had a quick look at "Digital Technologies". What surprised me was that this is essentially the VET program slightly reworked. The VET and school systems use different approaches to education, for example VET students are not awarded grades, they are just "Competent" or "not yet competent". Students can provide evidence of prior learning and then skip some, or all, of the courses completely: is this being implemented in schools? Also it is not clear how the teaching of the topic is undertaken. There is no "program of learning" provided. That is, what is "competent" is defined, but not how the students get those skills, or how they are assessed. There is a feedback form provided, which appears to suggest that each teacher is expected to plan their own program of learning. If so, it seems very wasteful for every teacher in the ACT to be creating their own bespoke course materials, for a standardized curriculum. In the VET system, students use standardized, mostly online learning materials. There is no good reason for not doing this in schools, for essentially the same curriculum. I will be speaking on "Blend, Flip, and Back to the Classroom", at ANU in Canberra, 1pm, 15 March 2019. Tom Worthington, Marie Reay Teaching Centre, Room 2.02, ANU, 1pm to 2pm, Friday 15 March 2019. "In 2008 Tom Worthington ended his last lecture for the year at ANU by announcing it would be his last lecture, ever (1). Having become disillusioned with the lecture format, he has been teaching online for the last ten years, with his award winning course offered by three institutions, in Australia and North America (2). During that time Tom looked at alternative classroom designs in Australia and around the world. In February 2019 the Australian National University unveiled the Marie Reay Teaching Centre, a flexible teaching building (3). So this year Tom is going back to the classroom to apply what he has learned, with a blend of online and classroom teaching in the new building (4). This is intended to be a model for how academics can easily convert conventional courses to new interactive ways of learning, and allow each student to choose the blend of online and classroom learning to suit their needs." ps: Last year the theme ended up "Blended Learning for the Indo-Pacific", presented as a short paper at the IEEE International Conference on Teaching, Assessment and Learning for Engineering (TALE 2018) in December. This started out at the beginning of the year with an invitation from Sri Lanka's computer society to speak at their national conference. 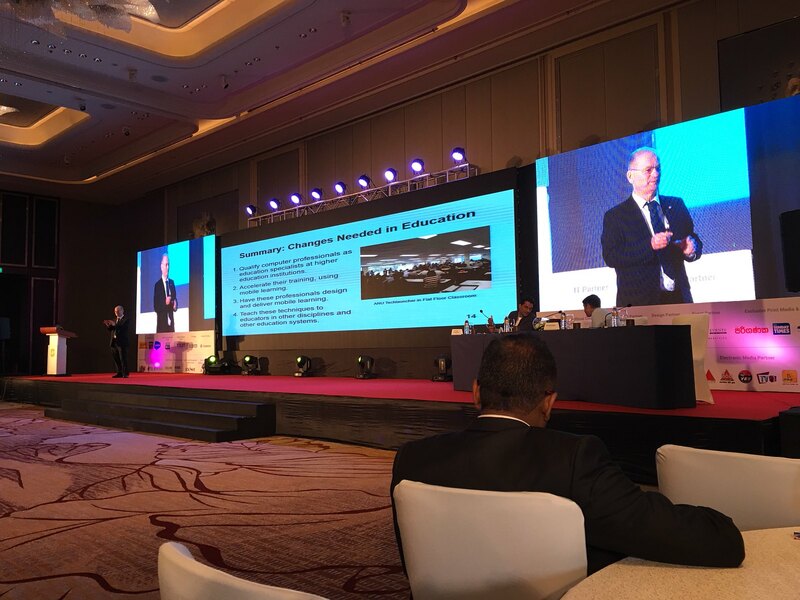 But before this the Australian Computer Society had a gap in their Canberra conference, so I first spoke on this, with 24 hours notice, in September under the title "Mobile Learning from Canberra with Microcredentials and Blockchain for the Indo-Pacific: Colombo Plan 2.0". Also I prepared a version for the Senate Inquiry into UN Sustainable Development Goals, and did a repeat performance for the ACEN WIL Snapshots Second Chance Conference. There may have been a few guest lecture versions as well. Greetings from the opening of the new Autonomy, Agency and Assurance Innovation Institute (3Ai) at the Australian National University in Canberra. Professor Genevieve Bell, aims to create a new applied science to address the challenge of cyber-physical systems. The institute has started with sixteen masters students, who will help work out what this new discipline is. The emphasis is on "cross disciplinary" work. For 2019, there are courses, starting with "Fundamentals of a New Applied Science I" (CECS6001). Inventing a new discipline, while teaching it, is something rarely attempted, and even more rarely succeeds. I suggest the new Institute would benefit from studying past attempts and having the students research these. Environmental Studies continue today at Griffith University. A better known international example is the Bauhaus, a German art and design school of the early 20th Century. The organization suffered internal conflict and external pressure. I was invited to talk to the Bauhaus Dessau", but while this occupies the original premises, it has a limited and less radical outlook. ps: I first came across Professor Bell, in 2009 with the Realising Our Broadband Future forum. Then in 2010, speaking at the NLA in Canberra on The Future is Messy, the next week I bumped into her at the SA Library in Adelaide cafe. She was cited in the 2011Regional Telecommunications Review. Then in 2017, it was announced she was joining us at ANU. Greetings from the Energy Change Institute Open Day at the Australian National University in Canberra. During his keynote presentation, Professor Armin Aberle, from Solar Energy Research Institute of Singapore (SERIS), mentioned the problem of architects accepting solar panels on buildings. I suggested collaborating with architects who are exploring using new modular building techniques, such as BVN, with the ANU Kambri complex, opened yesterday. Professor Aberle, pointed out that high rise buildings have relatively little roof space and there is now technology for transparent panels which can be used as windows. But these panels need to look good, and need to be easy to install. The new student towers at ANU have prefabricated wooden panels hung on the outside. These are covered with ceramic "biscuits" in a factory, and conventional windows, before installation. This system could be used with solar panels and translucent panel windows. These would be hung on the building and then plugged into the grid. Prefabricated solar building panels could be relatively low-tech, with the same mounting systems as used for buildings simply screwed to the wooden building panels. The solar elements would be attached and wired to a plug. The completed panels would be stacked on a truck. After lifting into place the panels would be plugged in. 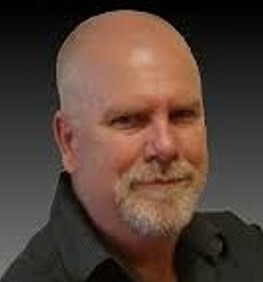 ps: I am a member of the ANU Energy Change Institute, teaching ICT sustainability to masters students. Greetings from the Marie Reay Teaching Centre at the ANU Kambri complex, by lead architect Ninotschka Titchkosky of BVN, and constructed by Lendlease. The buildings opened in Canberra this morning. ANU Online, the central ed-tech unit, is running a series of workshops to teach the staff to use the new building for flipped and other forms of flexible learning. In 2008 I gave my last lecture at ANU, having decided that more flexible forms of learning are needed. Since then I have been teaching online. But with the opening of the teaching center I have the facilities to go back into the classroom. There is no point in spending millions of dollars on a new building with furniture on wheels, movable walls and flat floors, and then use it for old fashioned "lectures". This requires "lecturers" come to terms with a different way of teaching. Also students need to understand that getting them to do things, is the essence of teaching. The first workshop right now is by Dr Graeme Salter. We are sitting in one of the smaller rooms and Graeme is using some of the techniques he advocates, such as online polls to keep student attention, as part of the workshops. This is fun, with one participant saying they get students to imagine they are a tomato. I have booked a room in the building to do flipped teaching in a few weeks time in a module on How to Write Job Application. My first impressions of the building are good. This is a six story hi-tech wooden building. The wooden beams are visible as part of the aesthetics of the building, along with wooden ceilings. There is an open staircase, with adjacent informal space for students, then classrooms around the outside. The classrooms have glass walls to the central areas, flat floors and retracting room dividers. The flip top tables are on wheels. This is a style of room previously best implemented at the University of Canberra Inspire Center. What I liked was that all the rooms in the Marie Reay Teaching Centre were rectangular, without any gimmicks. Many institutions install round, or oval shaped rooms, in an attempt to improve interaction, but these waste space and make it difficult to place desks and screens. Also institutions tend to want a tech-gimmick, just as a 3D room, or a giant ultra-high definition screen wall. These tend to be break, or are decommissioned after a few months, when the novelty wears off. The Marie Reay Teaching Centre is clearly aimed at flipped group learning. You could give a presentation, but there are no lecterns, to make it just that little bit more difficult to do so. The wooden building doesn't look high tech, but the wifi, projectors, and sound reinforcement are all there and working. One thing to keep in mind is that all of the online resources of the institution are available in the classroom. So rather than finding some new online tools, those already available in the learning management system for students to use remotely, can be used live.in the classroom. The only glitch so far is the display screen in the foyer has the image inverted. For a new building that is very good. The classrooms have glass walls which gives a more open feel. But it may be a little distracting for the class when there are large number of people moving outside. The glass might need some more frosting, so the sense of openness is not lost, but there it is not like being in a fishbowl. The classrooms could do with some small electronic screens on side and back walls, display what is on the main screens. Also the whiteboard on walls need some additional lighting. But these are minor matters. I did question the decision to have the teaching rooms around the outside, and the informal spaces in the middle, without a direct view. But then I noticed the classrooms had been strategically placed, so the open areas get magnificent views across Canberra. Walking past the new buildings I had a feeling of had been there before, although it just opened. 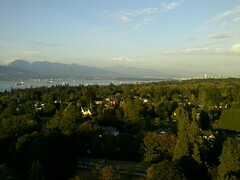 Then I recalled walking the avenues at University of British Columbia, Vancouver Campus, which I spent a week at l2015. ANU has taken the approach with Kambri of retaining separate tiered lecture theatres and flat floor group work rooms. I spent several years trying to work out a design for a classroom combining the features of a lecture theatre and group work room. Early versions were limited by the need to accommodate power and data cables and, desktop computers. The advent of WiFi and portable devices removed those restrictions. Eventually I decided it was just not possible to reconcile the conflicting requirements, and better to have separate optimized rooms. In 2015 I attended conferences in Hong Kong and Cambridge. Both of these were held in rooms with retractable tiered seating. A similar setup has now been installed in Kambri. This allows for a large lecture, or by retracting the seating, a large flat floor event. As an alumnus of Athabasca University (AU), I recently received an invitation to participate in a "Master of Education Program Review Process". Unfortunately to do this I either have to travel to Edmonton (13,000 km, 20 hours flying time, at a cost of AU$1,800), or attend a teleconference at 4:15 am Canberra time. Neither of these is convenient. So I replied, pointing out that when a distance education student at AU, we were routinely offered two times for live online activities. One time was for North America, and the other for the rest of the world. Also there were downloadable documents, recordings, and asynchronous forums provided, for those who missed the live sessions. The reply I got from the Office of Institutional Studies at Athabasca University was "Unfortunately we don't have an alternate timeslot available for this review". AU prides itself on being "Open. Online. Everywhere.". I suggest this review process also needs to be. AU runs an excellent online MEd program. AU's Office of Institutional Studies is placing the reputation of that program, and the whole university, at risk, by not appearing to understand the fundamentals of running an online university. The EU has released "Future of Scholarly Publishing and Scholarly Communication", by a panel of experts, including from the Bill and Melinda Gates Foundation, Wellcome Trust, Elsevier, and Springer Nature. Not surprisingly, Springer Nature and Elsevier did not agree to the rest of the experts' recommendation to move to open access publishing as soon as possible. I don't agree with one of the panel's unanimous recommendations: not to use journal-based metrics for hiring, promotion and tenure, and funding decisions. In my view, metrics are essential, but the right metrics. Several recommendations urge balanced and diverse representation (gender, geography and career stage). Using blind reviews, not just for papers, would go some way to achieving this. "... accessibility, maximum usability, and accommodating an expanding range of scholarly contributions (data, software, new documentary forms, etc.). ... a distributed infrastructure based on open standards to ensure access and interoperability. ... equity, diversity and inclusivity, and to the need for community building. ... quality and the integrity of scholarly contributions ... flexibility and innovations while also retaining its focus on cost effectiveness." From "Future of Scholarly Publishing andScholarly Communication" (EU, P. 6, 2019). "When participating in research assessment, for example in hiring, promotion and tenure, and funding decisions, focus on the merits and impact of a researcher's work and refrain from the use of metrics - particularly journal-based metrics - as a proxy. In particular, they should incorporate the recommendations from DORA and the Leiden Manifesto into the assessment process. Take responsibility for ensuring that all research contributions are made openly available, discoverable, and reusable according to agreed community standards (including the FAIR principles). Increase awareness of, and sense of responsibility for, implications of choices and actions in roles as authors, reviewers and members of decision-making groups. Strive for a balanced and diverse representation (in terms of gender, geography and career stage) when seeking collaborations, organizing conferences, convening committees, and assigning editors and peer-reviewers, and building communities such as learned societies. Work towards increased recognition and appreciation of peer-review work as core research tasks. To this end, support greater transparency, including the publishing of signed reports. Support better training and inclusion, and focus on quality of the research in peer review. In the case of communities of researchers, such as learned societies, develop policies and practices that support modes of scholarly communication in line with the vision outlined above. Along with universities, learned societies and other research communities need to alert and train their researchers to the importance and the responsibilities of communicating knowledge, either formally, through publishing, or through other means." "Develop policies and practices to ensure that all research contributions are made openly available, discoverable, and reusable according to agreed community standards (including the FAIR principles). Promote and implement the recommendations of DORA and the Leiden manifesto to ensure that research assessment takes into account a wide range of scholarly contributions including research articles, preprints, datasets, software, patents and materials (e.g. in hiring, tenure, and promotion decisions). In deciding which infrastructures to use, support, and contribute to, choose platforms using free or open source software, offering open data via an open license, and leveraging open standards where possible. Acting in this fashion will also reinforce researcher-led initiatives that aim to facilitate scholarly communication and publishing. Strive for a balanced and diverse representation including, but not limited to, gender, geography and career stage) when hiring, seeking collaborations, when organizing conferences, when convening committees, and when assigning editors and peer-reviewers, and building communities such as learned societies. In negotiations with service-providers refuse non-disclosure clauses and include clauses which enable cost and price control, and compliance monitoring. Strive to facilitate collective action with other institutions by e.g. sharing cost and price data through joint initiatives (e.g. OpenAPC)." "Develop policies - along with appropriate funding mechanisms - to ensure all research contributions arising from their funding are available to everyone, everywhere, without any barriers to access or restrictions on reuse. When evaluating researchers, ensure that a wide range of contributions (scholarly publications, but also data, software, materials etc) and activities (mentoring, teaching, reviewing etc) are considered, and that processes and criteria of evaluation are both appropriate to the funder’s research programme, and transparent. Develop funding mechanisms to support the development of open, interconnected and distributed scholarly publication infrastructures, and for their maintenance over the long term. Consider how funding policies affect diversity and inclusivity of research on a global scale. In particular, funders should work to ensure that review boards, committees, panels, etc., are diverse - in terms of gender, geography, and career stage. Work with the other actors in the scholarly communications ecosystem to ensure that the total costs of enabling research to be openly available to everyone, everywhere, without barrier or restriction, be also open and transparent." Develop, use, and support interoperable tools (including open source software wherever possible) and services not only to facilitate access and reuse of scholarly outputs, but also to facilitate innovative interventions of new entrants. Strive for balanced diversity (including, but not limited to, gender, geography and career stage) among authors, reviewers, and editors who work with publications. Make all publishing charges public (including special pricing and waivers), and provide full descriptions of services provided, in order to enable the development of a transparent and cost-effective marketplace designed to support the open communication and reuse of all scholarly contributions. Experiment with new approaches to the evaluation and communication of research outputs, and share the outcomes so that a body of evidence can help to optimise future systems." "Organize and advocate for free access to, and right to reuse of, publicly funded research results. Reach out to funders, research institutions, and policy makers in order to develop new communication channels, new forms of co-creation and co-planning of research, and new forms of funding in response to needs, concerns and issues emanating from the population at large. Look for opportunities to engage with research topics / results that are of interest to societal groups and their communities. Bring forward research topics/questions that are mis- or underrepresented (e.g. by contacting relevant researchers, attracting the attention of other actors in the science system, or mobilising action in organised interest groups)." Dr Inger Mewburn, has called for a fairer, more humane system in academia, in her blog, "The Thesis Whisperer". This was a new year's resolution, and reflective post. For the last two years she has been working on the theme "Less", but the 2019 the theme will be "Care". However, I suggest "Professional" would be better. Dr Mewburn, raises the issue of the high workloads in academia. The problem with "Less", I suggest, is that there will always be more demands on the time of an effective person, than there are hours in the day to do them, and "Care" can result in being emotionally blackmailed. Being more efficient will not help, as that will just increase the demands on your time. What I suggest is a conscious choice as to what to do, and more importantly, what not to do. Dr Mewburn, discusses the stresses of attending an international conference on a limited budget. Each year I try to attend one international conference. I mostly have to pay my own airfares, conference fees and accommodation. One way I have found to get the most from this expensive and time consuming experience is to squeeze in another conference, and talks, on the way. There are few direct flights from Australia, so I look for another conference wherever the plane stops. Often conferences are happy to have someone chair a session, or give a talk, to make up for a last minute cancellation. This year I was invited to speak at the Computer Society of Sri Lanka National IT Conference (NITC 2018). Flights were via KL or Singapore, so I looked for conferences there. I found EduTech Asia 2018 was on and the organizers responded with a speaking slot, and free registration. Another way to reduce the stress when traveling for conferences is to use public transport. This may take more time, but imposes a timetable which makes it easier to refuse requests to squeeze extra work into your schedule. One tip is to use overground transport, avoiding the subway. Singapore, HK, and London have very efficient subways, but they also have excellent double deck buses, which provide a view, if you are not in a hurry. Also I have found booking the cheap student accommodation offered at conferences less stressful. For the IEEE International Conference on Computer Science and Education (ICCSE 2014) I booked a room in the UBC Walter Gage Student Residence. Most of the delegates were in more expensive accommodation, so I had a five room apartment to myself on the top floor, with a balcony looking out over the mountains. Dr Mewburn, expresses concern over the stress from working in academia. She suggests an emphasis on being "resilient", transfers the problem from the system to the individual, and instead calls for a "better, fairer, more humane system in academia". While I support this, I suggest we need to also train our students, be they destined for academia, or for industry, to be "professional". The academic system is not the only one to exploit its workers. Where you have people who love what they do, there can be a tendency to take advantage of them. I suggest that academics need to consider themselves professionals, and that they are training professionals. A professional looks after not only the interests of their clients, and their employer, but their own interests as well. For several years I gave lectures to ANU's computer students on "Professional Ethics". This is a compulsory subject for all degree programs accredited by professional bodies. Professionalism is, in part, about the obligations of the individual to their staff. However, it is also about their obligations to themselves. Professionals are required to take time to keep up withe skills, and are obliged not to take on more work than they can do. These obligations are so the professional can do a good job for their client, but a byproduct is to avoid overwork. Dr Mewburn, voices the dilemma all academics face, where they are encouraged to look after students and engage in activities which impact the wider world, but tend to only be promoted for publishing peer reviewed journal papers. I suggest it is possible to find a comfortable mix. Bogs, videos and book can be sued to promote journal papers. Hopefully we are reaching the point where more than just formal papers will will be counted as serious work output. What I do each year is choose a theme, or a theme chooses me. I plan to prepare a paper on the theme for formal presentation at a conference. Along the way there might also be a book. Also I will present to parliamentary committees on the topic, and talk to the media. What I always do is to make a point of explaining to my institution how this helps promote their courses. Sometimes these themes just evolve. Last year it was "Blended Learning for the Indo-Pacific", presented in Canberra to my professional body, then in Colombo, a formal paper at an international conference in Woolongong (and to be repeated at USyd on Monday). Along the way I presented a version to a Senate committee (the previous witness was the ANU VC, who asked "Tom what are you doing here?"). It happened then that DFAT were looking for ideas, so I pitched my paper to them, slightly modified, for $250,000 in funding. Along the way I spent a delightful few days in Singapore, at a conference meeting up with acquaintances from around the world. This year's theme will probably be about peer assessment for blended learning of professional skills. I offered to help with professional skills, and now find myself with 60 masters students to teach in ANU's new flexible building. I started by blogging what I might teach, now I am finalizing the formal learning design. Next I will teach. That will likely result in a conference paper, perhaps a book, later in the year, or next. As professional skills and blended learning are hot topics, there will likely be conference invitations and media interest. ps: The inspiration for my Higher Education Whisperer blog, came from Dr Mewburn's Thesis Whisperer.